Take advantage of the unique advantages of our solutions for rural installations! New standard and selector April pricelists available now! Our intrusion brands more accessible than ever! Visit By Demes Group at ISEC 2019! New standard and selector March pricelists available now! We continue growing in Ireland! 4 cameras + 1 free with your logo ! New February CCTV and access control pricelists are now available! New January CCTV and last units pricelists are now available! We wish you a Merry and Safe Christmas and a successful 2019 full of Prosperity! Our Black Friday becomes Black HYUNDAYS! New November CCTV and last units pricelists are now available! Western Digital and Seagate HDD more affordable than ever! New October CCTV and last units pricelists are now available! New September CCTV and last units pricelists are now available! The offer 4 cameras + 1 free with your logo is extended! New August CCTV and last units pricelists are now available! Your invitation to BY DEMES OPEN DAY! New July CCTV and last units pricelists are now available! 4 cameras + 1 free, the hottest promotion on these super cool cameras! New June CCTV pricelist is now available! We extend the two HYUNDAI offers for the celebration of our new Dublin offices opening! HYUNDAI 4x3: buy 3 and get one for free! Check out our new HYUNDAI IP kits! Airspace Coloso Evolution and neutral DVR and NVR, now works with SMARTPSS and official IDMSS! New April CCTV pricelist is now available! Customize your favourite cameras with your own logo! New HYUNDAI&VAELSYS LPR residential KIT STOP&GO! New March CCTV pricelist is now available! New February CCTV pricelist is now available! Visit us at our stand 10D07 in SICUR 2018! HYUNDAI TURBO HD reach the target on 4K resolution! Your HYUNDAI ZVR with a HDD mounted at an incredible price! New January CCTV pricelist is now available! We say goodbye to 2017 with the offer on 3MP IP cameras with motorized autofocus lens! We wish you a Merry Christmas and a Happy and Safe New Year! The high-end HYUNDAI IP cameras and their compatible NVR 4K has never been more affordable! Discover the HYUNDAI cameras and ZVR with PoC system presented as a world premiere! Acquire now the best IP cameras in the market at the best price! Our DVRs with HDD and HD cameras are on Black Friday until December! New Delivery Point in Ireland! Why HYUNDAI is the best option for installers and end customers? Our HYUNDAI bundle has been extended until December 31! November's new CCTV pricelist is now available! Join to the dark side with our new 4 in 1 and IP Dark Grey Series cameras! We've gone crazy, 250 TOP products at cost price! Our CCTV pricelist of October is available now! Exceptional offer on HYUNDAI monitors! HYUNDAI ROADSHOW 2017 is coming! Don't miss our perfect kits for videoanalytics! Choose the HYUNDAI domes for their maximum quality, compatibility and now for their price! Check out our new HYUNDAI IP kit offer! Back to work with the best HYUNDAI offers! Our 4 in 1 4 MP cameras are already compatible with all DVRs! The offer of our fantastic HYUNDAI bundle has been extended! Discover our new exclusive HYUNDAI catalog 2017! We continue to enjoy the summer with new cameras on sale! New improved version of HYUNDAI IP video door phone! Get an extra HYUNDAI IP camera for the purchase of 3! Do not leave on vacation without your 4 in 1 cameras on sale! Discover our fantastic HYUNDAI bundle! This summer refresh yourself with the best offer on 4 MP IP cameras! 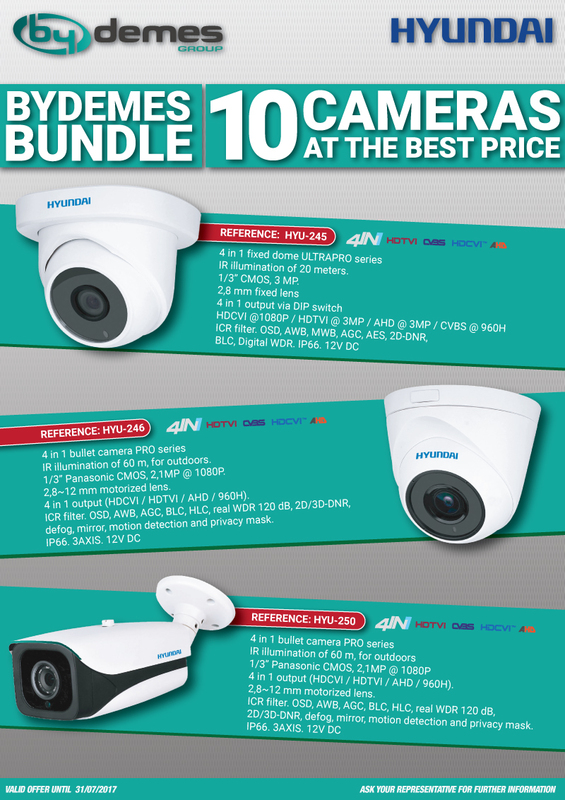 Do not miss our 10 HYUNDAI cameras at the best price! Get 10 HYUNDAI 4 in 1 fixed domes at the best price! Download now the new CCTV pricelist of June 2017! Maximum quality HYUNDAI monitors have arrived as a novelty from the world-renowned brand! Visit us at ISEC 2017, Dublin! Starlight HDCVI Cameras: get for the best price an exceptional image quality in extreme light conditions! Visit us at Security Twenty 2017, Dublin! We give you 1 camera or NVR HYUNDAI for the purchase of 3! Get your IP bullet cameras at unbeatable prices! Take advantage of super prices on our HYUNDAI PRO HDCVI super cameras! New CCTV pricelist of February 2017: the best technology on the market at your fingertips! Do not miss our 3 MP IP cameras on sale! Visit us at New Security 2017! On the occasion of the 15th anniversary of AIRSPACE, super offer on its IP cameras! Visit us at Intersec 2017! We give you a Uniview recorder when you buy the IP cameras! Get a free DVR with the purchase of the best market cameras! ByDemes team wishes you a Merry Christmas! Hyundai ties up with by DEMES S.L. You can already check the net prices with your assigned salesman, clicking on the image or in our "Offers" section once you have logged in. The offer is valid until July 31st, 2017. Would you like to receive our weekly offers and news in your e-mail or access them directly through our exclusive "Offers" web section? Register here.